The responsibility that a marker has in signing a player’s card was brought into sharp focus on the first day of the European Tour’s Andalucian Open in Malaga on Thursday, when a player and his marker were both disqualified. The circumstances were that Spaniard Borja Etchart, a 21-year-old playing just his third European Tour event, was accused of wrongly replacing his ball on two putting greens. His marker, Norwegian, Eirik Tage Johansen, did not report it to officials before signing the scorecard. Johansen had spoken to the third player in the group, former Ryder Cup player Andrew Coltart, about the way Etchart replaced his ball on the putting greens and they had agreed that it was not done according to the Rules. However, it seems that neither player said anything to Etchart on either of the two occasions, which seems curious to me. Surely, they could have prevented any breach by mentioning their concern to the player as it happened. Information on the Rules is not advice and players are permitted, indeed encouraged, to prevent any breach of the Rules. Rule 20-3, part of which states; “A ball to be placed under the Rules must be placed…. on the spot from which it was lifted…”. By signing Etchart’s card Johansen knowingly ignored the breach of Rule that he had witnessed and also had to be disqualified. “The responsibility for knowing the Rules lies with all players. In stroke play, the player and his marker have an explicit responsibility for the correctness of the player's score card. By knowing the Rules you can help not only yourself but those that you play with as well. Have you subscribed to ‘Rhodes Rules School’, a weekly series of emails posing questions that are based on an accompanying photo, or photos? No charge and you can unsubscribe at any time. Click here to start receiving the emails, one per week. I'm curious how he was marking and replacing the ball. It would be great to have a video of the proper method and someways that might not be truly proper by the rules. I have not been able to find any information on what exactly happened. The usual marking breaches are marking the ball too far away from where it lies (it should be marked immediately behind it) or marking in front of the ball and then replacing the ball in front of the marker. The important point is that the ball MUST be replace on the spot from which it was lifted. Done. I was just finishing the blog as your comment arrived! I don't see Etchart and Johansen as agreeing to waive the Rules. Nothing was said between them. Etchart may not have even known he was breaking a Rule. I see Johansen DQ'd not under 1-3 but under 33-7/9, for not informing of the breach in a timely manner. He could have brought it up before signing the card so Etchart would only get a 2-stroke penalty for each breach, he didn't. His clear intention was to have Etchart DQ'd for an incorrect score. I see Coulthard as only being DQ'd under 33-7/9 if it could be proven he also had the clear intention of bringing up the breach after card had been signed. Your thoughts?--I'd like to get a bit more of a grasp of ignoring breaches. "21-year-old Etchart, appearing in only his third Tour event, failed to add two penalty strokes for playing a ball from the wrong place. Both of his playing partners reported to the committee after the scorecards had been returned that they had seen Borja incorrectly replace his ball on the 16th and 18th green in a manner that both players felt was careless. As a result Eirik Tage, the marker of Borja's scorecard, was disqualified for signing for a score that he knew was lower due to the failure to include the penalties." So, obviously Rule 1-3, Agreement to Waive Rules, was not relevant. In my opinion Coulthard could only have been disqualified if he and Johansen had tried to cover-up the penalty incurred by Etchart and this subsequently came to light. Please could you let me know what should happen when a score card is signed by both competitor and marker and handed to the organiser with the wrong result recorded due to the players handicaps being recorded on the card correctly but divided by two incrorrectly hence producing the wrong final score. 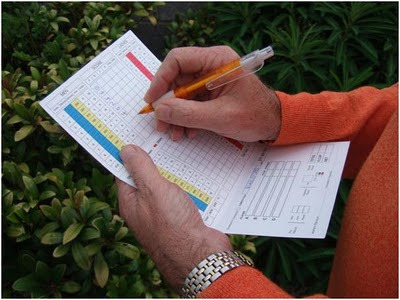 Providing the player's or players' full handicap(s) and gross scores for each hole are correctly recorded on the card their scores should stand. The Committee is responsible for the addition of scores and the application of the handicap recorded on the score card. (Rule 33-5). "Q. In a stroke-play competition, A returns a card showing the handicap to which he is entitled and the Committee applies the wrong handicap or miscalculates the correct net score. This results in another competitor receiving a prize to which A was entitled. The error is discovered after the competition has closed. What is the ruling? A. The Committee should correct its error by retrieving the prize and awarding it to A. There is no time limit for correcting such an error. Rule 34-1b is not applicable since it deals with penalties and not with Committee errors."